With your 2018 CSA subscription, you get nine unique works of art help Bunnell Arts Center launch a new forum for connecting artists and collectors. Our nation’s first program started in 2010 in Minneapolis by Springboard for the Arts. Today there are over 50 CSA programs in the US and Canada. 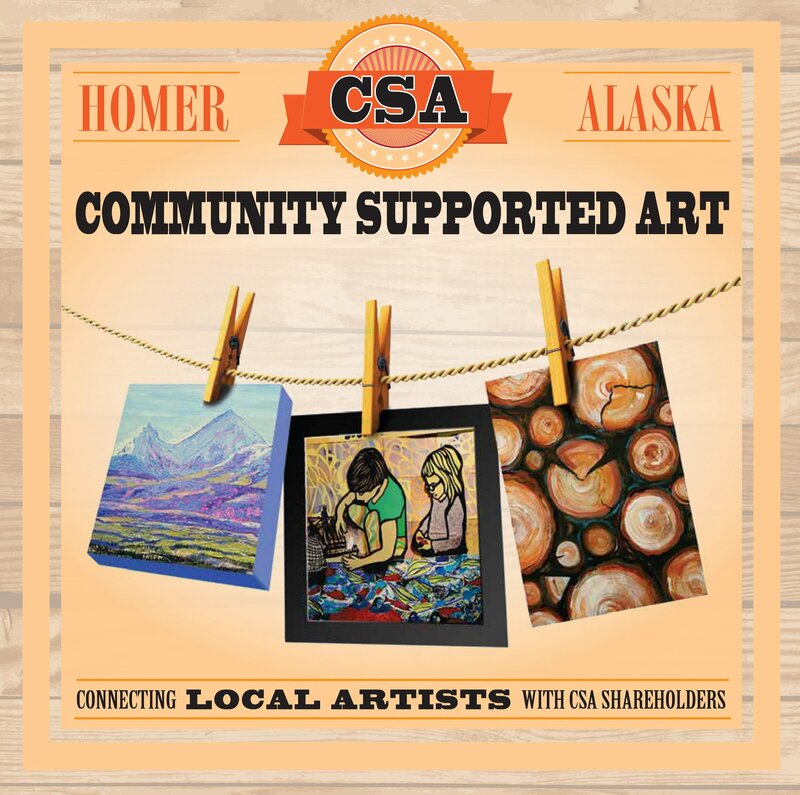 A CSA supports connects artists and non-profits with a base of collectors, to help artists emerge within a community of supporters. Shareholders seed a new crop of Alaska artists! Artwork for this CSA was contributed by Bunnell’s Board of Directors. All funds will be stipends for artists to create a new body of work. This CSA seeds the next year’s CSA, when emerging Alaska artists will be invited to create 30 new pieces of art for which they are guaranteed payment. Bunnell Board member, Susan Johnson led this project. She created archival photocards of Kachemak Bay and Cook Inlet that can be framed or used as notecards. She moved to Homer from Cambridge, Massachusetts in 2014 to pursue her life-long passion for the arts. Maura Brenin created 3 x 3 inch paintings of Homer’s fields in fall. Maura has been known for her outstanding catering, since she moved to Homer in 2001. Few people know that she studied painting at Savanna College of Art and Design. “We live within a web of life on this beautiful awesome Earth we call our home. Everything is connected. For this Community Support Art project I chose to embellish a container for the artworks included in this project, by using images of some of my artwork. As an object I hope these boxes find further use to those who purchase shares in this initial project. 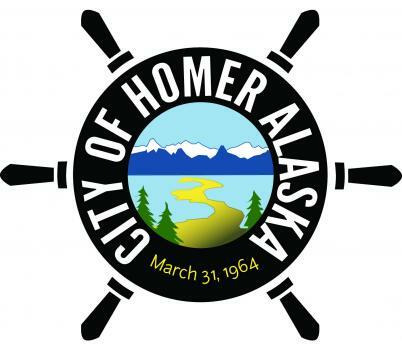 As an ardent conservationist, a beautiful box seems a fun and appropriate way to offer something that can be used to conserve valued possessions,” Rika Mouw, Homer. Linda Robinson of Homer created hand felted “soap in a parka,” 100% lambswool roving felted around handmade soap by Homer’s Tammy Marsengil. The parka gently exfoliates skin, secretes lanolin for moisture and may be recycled as a drink coaster, used as a dollhouse rug or placed in a tree for an exotic bird’s nest lining. “These handkerchief patches are hand-printed with a motif of c’enk’one’ or dentalium. Dentalium is a traditional material used by Indigenous peoples across North America. In Ahtna territory, c’enk’one’ was a symbol of love and respect. We have stories of fresh water dentalium found in lakes. To “catch” beads one would take a piece of rot hide tie it off to a tree and throw it out in the lake. After a few weeks one could pull the hide out and find the c’enk’one’ attached to the hide. C’enk’one’ is traded and gifted amongst Indigenous peoples today. This patch is created with non-toxic water-based ink. It can be cut and sewn on to clothing but should be hand-washed and or dry-cleaned” –Melissa Shaginoff is an Athabascan and Paiute artist and curator from Kenai. Ann-Margret Wimmerstedt of Homer created encaustic paintings on wood panels of Homer peonies. Encaustics are one of the oldest forms of painting, found as the portraits of the deceased in Egyptian tombs. Bees wax, mixed with pure pigment damar varnish and pure paraffin is stable down to freezing and up to 100 degrees Fahrenheit. These peony paintings can be buffed with a soft t-shirt material to remove dust and gently polish. Homer paper artist Desiree Hagen loves to meticulously salvage, sort, cut, sew and assemble found materials. Her books are her favorite form to collage memories and impressions of her life in Homer, Alaska. Shares are available to purchase here; thank you for supporting Bunnell’s CSA as an initiative to strengthen Alaska’s creative economy!